I Nyoman Suradnya speaks to Mark Ulyseas in an exclusive interview. “The red is me…it’s Suradnya. My colour I try to get the Bali smile – not Java smile, not Sumatra smile…Bali smile”. – I Nyoman Suradnya speaking to The Australian, Tuesday October 07, 1975, at his first exhibition of his paintings held at Aladdin Gallery, Sydney. The first time I met Nyoman at a friend’s place I took an instant liking to him because he knew the words of the song Release Me. We both sang it loud and out of tune till the dogs started barking. Later over a cuppa and fried banana fritters we discussed the state of art in Ubud. His frank and often strikingly honest remarks were a breath of fresh air after encountering many self proclaimed artists who were too eager to please any listener. The next day we met at his studio to carry on the dialogue. I began by asking him the usual question, “Why Ubud?”. He replied, “Because Ubud is where every breath is a prayer. Look around you at every nook and corner someone is making an offering to the Gods. The continuous religious ceremonies inspire this living culture. Ubud breathes life into the arts and many come here to live off this breath of living culture”. Nyoman is 60 years old. A child of a rice farmer, he worked in the fields helping his family. From a very young age he was intoxicated by the arts and crafts and would experiment with whatever material he had to create images on paper, in wood and stone. Inspiration came from the Wayan Kulit (Shadow Puppet) and then from his brother. He painted in black and white as in those days colour was not available. On finishing high school he joined the Art School started by Tjokorda Gede Agung Sukawati of Puri, Ubud. In fact Nyoman was the first student! Here he learnt painting, woodcarving, stone carving, carving for the Bull cremation towers from the masters of each craft. Like in India the concept of Guru-Sheeksha (Master-Student) was prevalent. After one year of the three-year course in the art school, Nyoman chose art on traditional lines learning proportion, perspective with regard to wood carving “Ubud Style”. He learnt the techniques from Balinese and non-Balinese masters. The market place was one of his haunts. Nyoman would visit the market to sketch the basic outline of his subjects. Then he would return to the studio and breathe life into the sketch with paint and brush strokes. Nyoman turned to the technique of Batik and went to Jogyakarta in 1973 to learn the art from the Javanese master craftsmen. On his return to Ubud he began by inventing batik colour pigments with some powder so that it could be blended like acrylics. 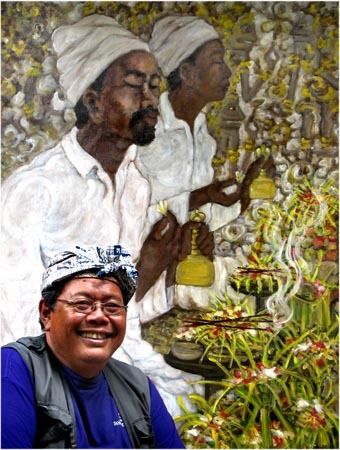 The special batik paint he created was used in his paintings to recreate the batik effect on his canvases. This was a groundbreaking technique that enabled Nyoman to take the craft of batik, which was confined to fabric onto another medium. The resultant effect was a creative leap whereby batik was not limited to fabric but became a medium that Nyoman could use to manifest his perceptions of the real world around him onto canvas. Colour exploded on the palette and splattered into shapes, forms and perspectives that immediately made Nyoman’s work recognisable in the numerous countries where he held his exhibitions. He became a pioneer in this field. Nyoman’s considers the word “artist” as one coined for or by tourists. The apt phrase according to him is Unagi, which means wood carver, builder, painter etc. All the arts and crafts were primarily for the Pura (House of God) and the Puri (House of the Royal Family). Later with the arrival of Walter Spies who was influenced by Henri Rousseau, the mingling of the two art forms resulted in metamorphosis of Balinese art forms. The local artist began to paint “daily life” and incorporated perspectives, subtleties of shading etc. The foreign artists and Balinese craftspersons took to each other like “bees to flowers”. Asked about his opinion on the numerous art galleries sprouting up all over Ubud he replied, “The mushrooming art galleries across Ubud are like McDonald’s fast food outlets. They’ve lost the plot. The kitsch is feeding the tourists because that is what the tourists want to see and buy. I do hope this does not continue otherwise good taste and discerning customers will fade away along with various art forms”. And when I enquired as to whether he had reached the zenith in his art form, he looked at me for a moment and then laughed loudly and said, “ I believe there is a promise land, a place I can reach nirvana with my artwork. However, I am still travelling and learning and travelling. When will it end I do not know. But I firmly believe it will be in this lifetime”. I Nyoman Suradnya has been known to speak his mind and to encourage his fellow villagers to beautify Ubud. In fact due to his endeavours Ubud won the Most Beautiful Village in Indonesia in 1982, 1984 and 1986. Some of his numerous past exhibitions were: 1977 Galerie de Geneva, Milan, Italy; 1982 Arts & Crafts Centre, Melbourne, Australia; 1985 ISLA Centre of the Arts, Guam University, USA; 1990 Gallery Balance, Osaka, Japan; 2004 Café Fleischli, Zurich, Switzerland. Today one can learn the craft of batik and batik painting from the master himself at Nirvana Pension & Gallery situated on Jalan Gautama , off Jalan Raya, Ubud.